Caution - Do not increase the proportion of onions, garlic, peppers or mushrooms. 2. 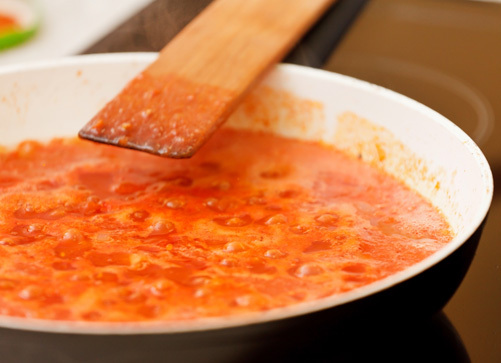 Wash tomatoes and dip in boiling water for 30 seconds to 60 seconds or until skins split. Dip in cold water, slip off skins, remove cores and quarter tomatoes. 3. Boil 20 minutes, uncovered, in a large saucepan. Press tomatoes through a food mill or sieve. 4. Saute onions, garlic, celery or peppers and mushrooms (if desired) in vegetable oil until tender. 5. Combine sauteed vegetables and tomatoes and add remainder of spices, salt and sugar. Bring to a boil. 6. Lower heat and simmer, uncovered, until thick enough for serving or until volume is reduced by one-half. Stir frequently to avoid burning. 7. Fill jars; leave 1-inch headspace. Wipe rims of jars with a dampened clean paper towel; apply two-piece metal canning lids. 8. process in a pressure canner according to the recommendations. 9. Let cool, undisturbed, 12-24 hours and check for seals.